Branson log cabins at Thousand Hills Golf Resort offer a luxurious and comfortable accommodation for couples who want to spend a romantic Valentine’s Day in a serene environment. Beautifully located in a secluded place along the hillsides of the Ozark mountains, most of the log cabins at Grand Mountain offers a comfortable living for intimate couples who want to enjoy a relaxing and romantic escapade this love month. These log cabins are beautifully designed with the inspiration of beautiful natural setting, fascinating wildlife, and magnificent landscape around the Ozark mountains. 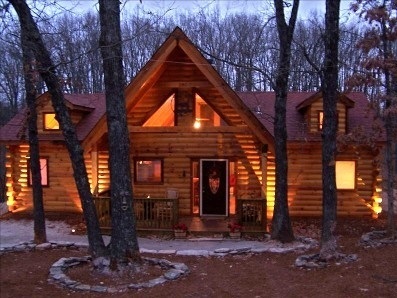 Log cabin accommodations in Branson are some of the most sought after in the area. These log cabin lodging options at Thousand Hills Golf Resort are perfect for intimate couples who need the space that most hotels can’t provide. In addition, every cabin unit is individually designed and decorated so that no two cabins will look alike, while each cabin still provides all the luxury and convenience that every guest expects. With great features of top quality amenities that you can enjoy around, you will surely feel great convenience with full satisfaction during your stay. Branson log cabins are fully furnished with great amenities such as free wireless internet access, cable TV with HBO, and DVD player. The kitchen of every log cabin is fully equipped with modern appliances like refrigerator, microwave oven, washer/dryer, pots and pans, and kitchen wares and utensils. Thousand Hills log accommodation is just perfect for intimate couples who want to enjoy the serenity that the place has to offer. According to many satisfied guests of Thousand Hills, the great location along with the relaxing atmosphere that they can feel is just what makes the place interesting to stay. As guest of the resort, you can have the chance to play with the most popular 18-hole golf course in Branson. The great location of log cabins at Thousand Hills is also one of the reasons why many guests want to spend a romantic Valentine’s Day celebration in a secluded place in Branson. The tranquility that you can feel around the area is a great way to enjoy a relaxing getaway experience in a calm environment. Although the location of the log cabin accommodations is surrounded with wooded valleys and spectacular rolling hills, it is actually near Branson’s entertainment district where you can enjoy world-class entertainments and exciting attractions. As the location of log cabin accommodations is near the places where entertainment, fun activities, shopping and dining, and great outdoor adventure are easily accessible, you always have the chance enjoy all these anytime you want. When you feel tired of hopping in around Branson, you might want to go shopping or enjoy fine dining at the new Branson Landing. In this great shopping spot, you can buy an array of unique shopping items such as arts and crafts, collectibles, and souvenir items. Branson log cabin accommodation is a perfect place to stay for intimate couples who want to celebrate Valentine’s Day in a calm place.